There are few great wines in the world that will make people stop in their tracks. These are wines that we read about, talk about with reverence, and occasionally, if we are fortunate, we get to taste them. One of these, probably the most famous of them all, is Domaine de la Romanée-Conti in Burgundy, France. I had the privilege to taste Domaine de la Romanée-Conti Echezeaux, Cote de Nuits, France 1996 in a seminar at Pebble Beach Food and Wine a few years ago. It was my first time tasting Domaine de la Romanée-Conti and in all probability, I thought, my last. These wines are sought after by wine collectors around the world and bottles will range from $2,000 to $20,000, or more. 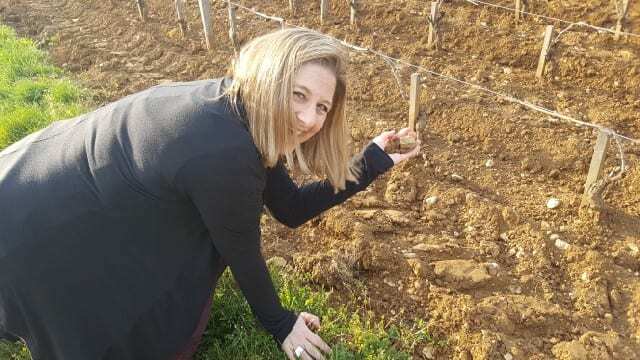 These stratospheric prices, combined with the limited production, make Domaine de la Romanée-Conti a wine for the wealthiest collectors in the world. We arrived in the small village of Vosne-Romanée and approached a gate. 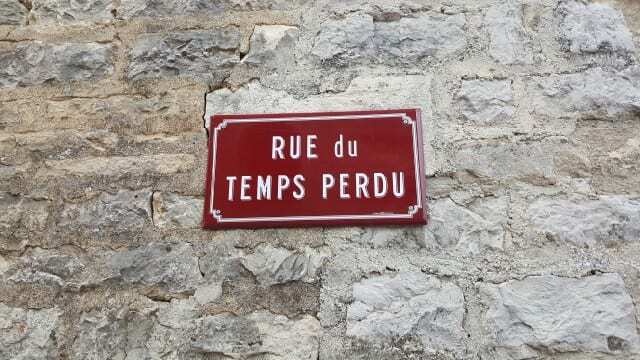 On the wall, next to the gate was the street sign “Rue du Temps Perdu” or the “Street of the lost time.” This was the humble, simple, ego-less entrance to the most revered winery in the world! I did not know what to expect. I was in awe and was simply honored to just step foot into the offices. Bertrand de Villaine, the nephew of Aubert de Villaine, the domaine’s co-owner, entered the room. He was subdued as he welcomed us, telling us he was happy we could visit but that he only had a little time to spend with us. He invited us to join him in the cellar. We walked across the village to an unmarked building behind a red gate. There were no signs and nothing to denote where we were. It was not large or fancy or modern. It was a wine cellar like most others in Europe. 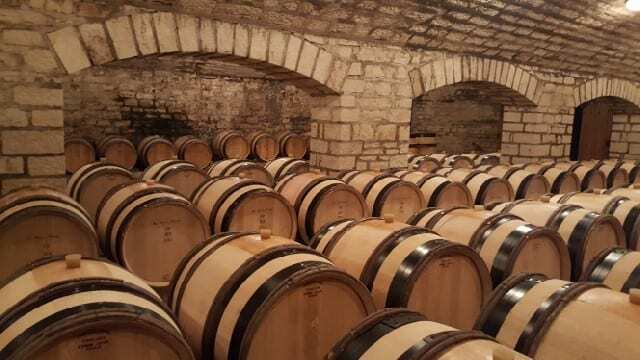 Until, that is, you look at the barrels and see the names of La Tâche, Corton, Echézeaux, Grand Echézeaux, Romanée St. Vivant, Richebourg and Romanée-Conti branded on them. These are the most famous Burgundy vineyards. Domaine de la Romanée-Conti is in the Cote du Nuit in Burgundy. There are five Grand Cru vineyards in the Cote du Nuit that are “monopoles” and Domaine de la Romanée-Conti owns two of them. While Domaine de la Romanée-Conti dates to 1869, the vineyards of Romanée-Conti and La Tâche go back 785 years. Romanée-Conti belonged to the Benedictine monks at the Abbey of St-Vivant as far back as 1232. Romanée-Conti, as well as La Tâche, were purchased by the Croonembourg family in 1631. After a few more owners over the centuries, the de Villaine and Leroy/Roch families purchased the domaine in 1942. Today, it is run by Aubert de Villaine and his nephew Bertrand de Villaine and for decades they have been producing the sought-after wines. It is a winery that honors its past and plans for the future. Domaine de la Romanée-Conti has been certified biodynamic since 2007, although that has always been a part of their practice. They make their own fertilizer just as their forefathers did. The average vineyard is 45-50 years old. “What was done back then is what we have today. And what we do today is for others,” Bertrand explained. It was hard to believe that we were standing in this world-famous cellar. There was no pretense; there was no ego. How could this be the most renowned winery in the world? Bertrand was straightforward when he explained that wine “is about pleasure and enjoyment,” nothing more or less. He then proceeded to invite us to taste barrel samples of the 2016 vintage. The 2015 vintage had just been bottled. The 2016 grapes had been harvested over a 10-day period beginning on Sept. 22, 2016. Bertrand handed us glasses and grabbed a wine thief and we began to follow him through the cellar. While the wines were just beginning malolactic fermentation, we were able to taste the nuance of each vineyard. We started with the 2016 Corton. My head was spinning as I put my nose in the glass. Yes, these wines were young and still developing but the aromas of pinot noir were distinct. We tasted the 2016 Echézeaux and my first reaction was “WOW!” Tart cherry and black pepper jumped out of the glass. It was mouthwatering. Bertrand described the wine perfectly. “It has the politeness to be accessible any time and it is complex without being complicated.” Sadly, 70 percent of the crop of Echézeaux was lost due to rain in 2016. The 2016 Grand Echezeaux was a grander wine with more structure on the palate. The 2016 Romanée St. Vivant was very aromatic with notes of blueberry and blackberry. The 2016 Richebourg had an elegant nose but it was the biggest wine with aromas of dark fruit, earth and leather and tannins. The 2016 La Tâche, from the largest monopole, was the prettiest wine with aromas of violet and powder. Two and a half hours later, our “short” visit with Bertrand de Villaine at Domaine de la Romanée Conti came to an end. But just after we said our goodbyes, we walked a few feet from the offices to the Romanée Conti vineyard. The sun was beginning to set over the vineyard as I tried to take in what I had just experienced. This was the visit of a lifetime. 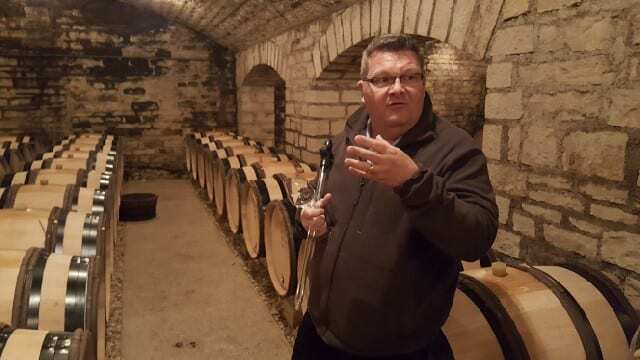 This entry was posted in Lifestyle, Travel, Wine and tagged Aubert de Villaine, Bertrand de Villaine, Burgundy, Corton, Cote de Nuits, Domaine de la Romanee-Conti, Echezeaux, France, Grand Echezeaux, La Tache, Napa Valley Register, Richebourg, Romanee St. Vivant, Romanee-Conti, Rue du Temps Perdu by Allison Levine.